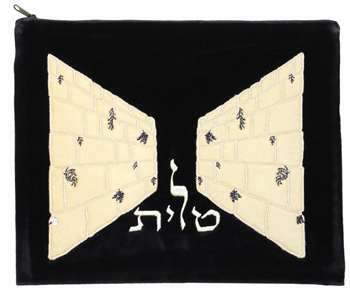 This velvet tallit bag has the one of Judaism’s holiest sites, The Western Wall, embroidered with creative and artistic expression. The Western Wall, is designed in a mirror image creating a 3-D effect. The bag portrays the image of a pathway symbolic of how prayers pass up to the gateways of heaven. The Hebrew word “tallit” is embroidered at the bottom of the design. This bag is only available as a tallit bag. This bag has the option of adding custom embroidery with Hebrew or English characters on top of the design. An optional clear plastic slip-on protective bag is available.